Fabtech’s Upper Control Arm system provides a 3.5” lift over stock with increased wheel travel and no suspension bind at full droop. Lift is accomplished with steel spacers that utilize the factory Coilover shocks for a stock ride. The replacement Upper Control Arms address the geometry of the front suspension with the new ride height for proper alignability. Heavy duty ball joints allow for extended suspension travel to eliminate binding. The system has been designed for proper CV axle angle and plunge thus eliminating the need to reposition the front differential. This 3.5” Upper Control Arm system allows clearance of 31” tires without the removal or cutting of the factory Intrusion Beams located in the front fenderwell. The Intrusion Beams are an integral part of the front collision safety impact feature of the Ranger and limits tire clearance to a 31” tire with a 3.5” lift. 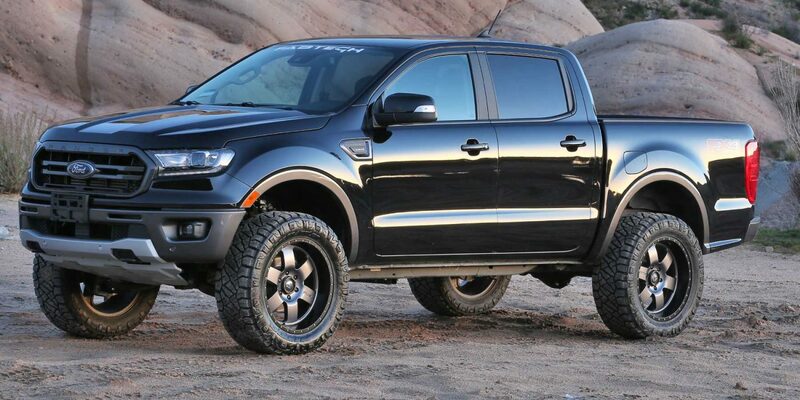 For Ranger owners that want to run a 33” tire, Fabtech offers optional replacement Offset Intrusion Beams. They directly replace the factory units helping to retain the safety feature of the Beams while allowing clearance of 33” tires. These 1/4″ thick steel Beams are offset to allow full steer with 33/12.50R tires w/ a 5” back space wheel. Rear shock options include Performance or Dirt Logic 2.25 shocks.